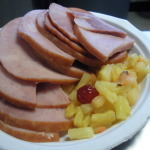 My ham of choice is Sugardale honey baked ham. I know that you may not have this brand in your part of the country or your part of the world, but I’m working on getting a link that you can purchase your ham through and have it shipped directly to you so stay tuned! When I started cooking, one of the most confusing things was trying to figure out how to buy a ham. What kind of ham, how big a ham, how to cook the ham. It was terrible! Well, hopefully, I have helped you solve a problem that it took me years to figure out. 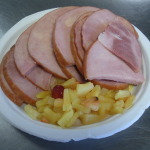 Sugardale hams are succulent, sweet and tender! I prefer the boneless option – no waste! I can still season my beans, greens, salads and soups with the left overs – so, win-win! Today, I used a simple baking method. I was out of brown sugar so I rubbed honey over the outside of the ham, blanketed it with pineapple tidbits and maraschino cherries and baked it for about 2 1/2 hours. I removed the ham, let it rest then sliced and served it. 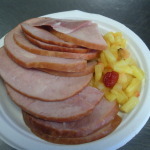 Simply delicious – family tradition making ham!